10 years ago I was living in Washington DC and working on the Waxman-Markey climate change legislation. I remember when it passed the House and died on the Senate floor. That’s the closest we’ve gotten to comprehensive climate change legislation in the United States. Achieve global reductions in greenhouse gas emissions from human sources of 40 to 60 percent from 2010 levels by 2030. Meet 100% of the power demand in the United States through clean renewable zero-emission energy sources by 2030. Achieve net-zero global emissions by 2050. Clean energy mandate, zero-emission vehicle mandate, electrification of transit, electric vehicle rebate program for consumers. 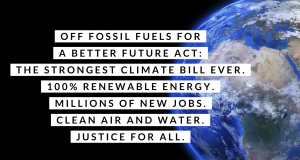 Moratorium on new major fossil fuel projects, ending fossil fuel subsidies, low-income weatherization and retrofit assistance. Extension of tax credits for wind facilities and solar energy. Ban on crude oil and LNG exports. Ban fracking. 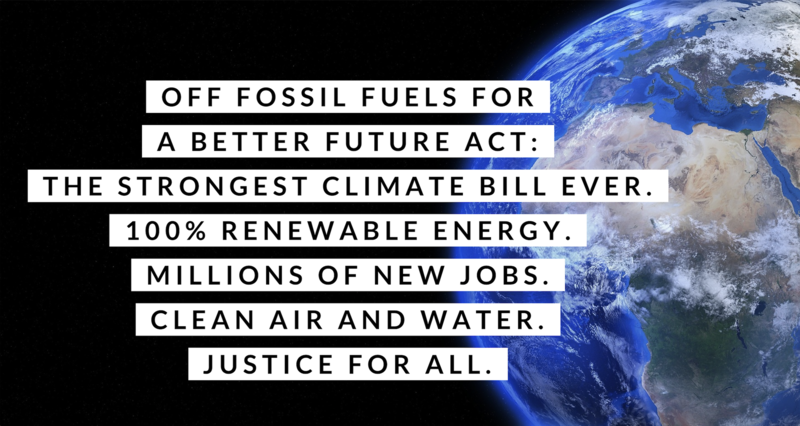 Environmental justice provisions for a clean energy future. Establishes the Center for Workforce Development within the Department of Labor and the Equitable Transition Fund within the Department of the Treasury to identify the employment potential of the energy efficiency and renewable energy industry and the skills and training needed for workers in those fields to support career transition period. A year prior to taking office, Alexandria Ocasio-Cortez signed the OFF Act pledge to endorse Tulsi Gabbard’s landmark climate change legislation. Tulsi Gabbard has been an early supporter of the movement for a Green New Deal and was the first 2020 presidential candidate to support a House Select Committee on a Green New Deal. Speaker Nancy Pelosi announced today a select panel on climate change called the “House Select Committee on the Climate Crisis” — this will be led by Rep. Kathy Castor (D-Fla.), and includes the following members: Reps. Ben Ray Luján (N.M.), Suzanne Bonamici (Ore.), Julia Brownley (Calif.), Sean Casten (Ill.), Jared Huffman (Calif.), Mike Levin (Calif.), Donald McEachin (Va.) and Joe Neguse (Colo.).